My love and I recently went to the Strip District for 2 things: sriracha and tacos. We both had the afternoon off and thought getting our errands done and getting to walk outside on a warm, beautiful day sounded like the perfect way to spend it. We forgot that this past weekend was St. Patrick’s Day, so we were surprised by how many people were out and by how hard it was to find a parking space. People were stealing parking spaces from under us with such determination that I almost thought I was at Whole Foods. Hahaha! After he grabbed a coffee from Allegheny Coffee and Tea Exchange, we walked a few blocks to Lotus Food. I used to come down here all the time for fresh tofu, but I haven’t been in a while. We took our time browsing the aisles and loaded out basket with all kinds of goodies. 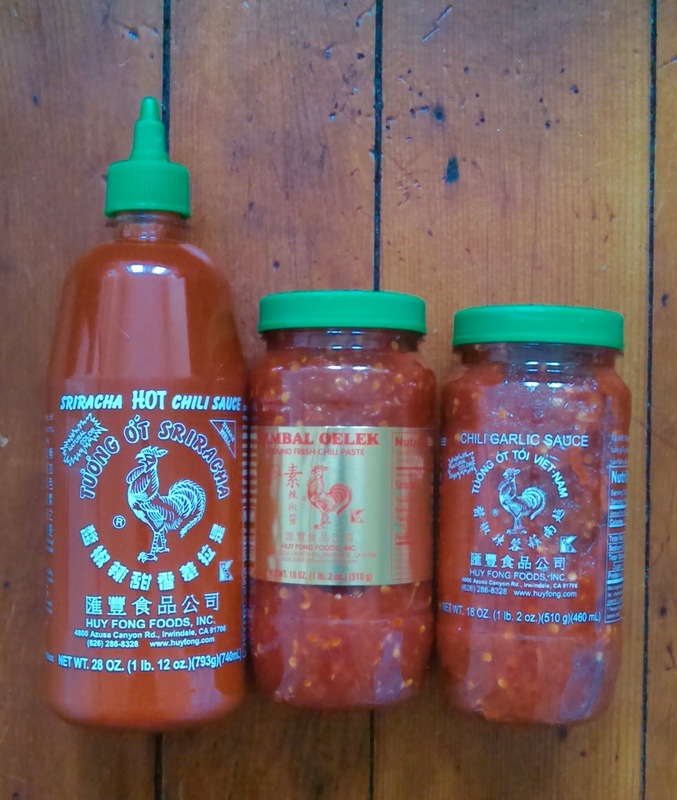 Of course, we got sriracha as well as sambal oelek and chili garlic sauce. He’ll go through this all before I even get a chance to touch it! Seriously though, he is a fiend for these hot sauces. I’ve come to enjoy tasting the subtleties of my food without too many spices and condiments, but fiery foods will always have a special place in my heart, too! All but one of the above foods were on my grocery list. I picked up a few Thai young coconuts, canned jackfruit, tamarind paste, and a special treat, sweetened dried hot mango. 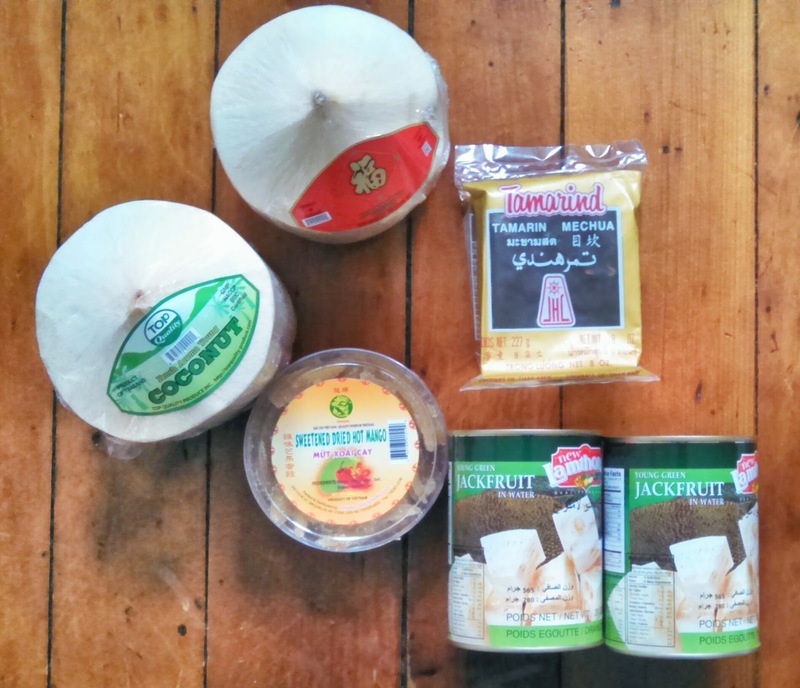 I’ve only ever eaten fresh, ripe jackfruit before, and I’m interested in experimenting with its savory side. The tamarind paste is different than the one I have at home (the one that is running woefully low, too low for this pad thai loving household), but it was all I could find. I’m sure it’ll be great! The mango was an impulse purchase. I see mango and chili together (see, I do love some fire! ), and I can’t resist. Even though I’m not one for buying sugar-covered fruits, I made a very delicious exception. 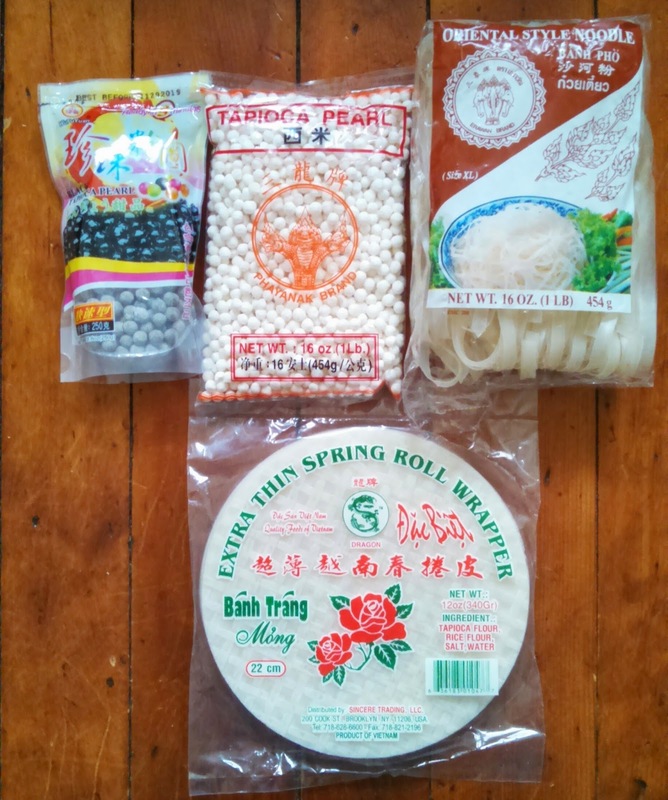 Also on our list was tapioca pearls, rice noodles, and spring roll wrappers. Now that summer is getting close, I’ll be making lots of wraps with these rice wrappers as well as with nori and collard leaves. I bought the tapioca pearls to make boba for the first time at home. The boba I get at restaurants always has the black pearls, but since they had some ingredients I wasn’t crazy about (ahem, artificial flavors), I got the white ones, too. I don’t know if there’s a difference, but I’ll find out! Lastly, I got some mochi because I can’t go to an Asian grocery store and not get mochi. 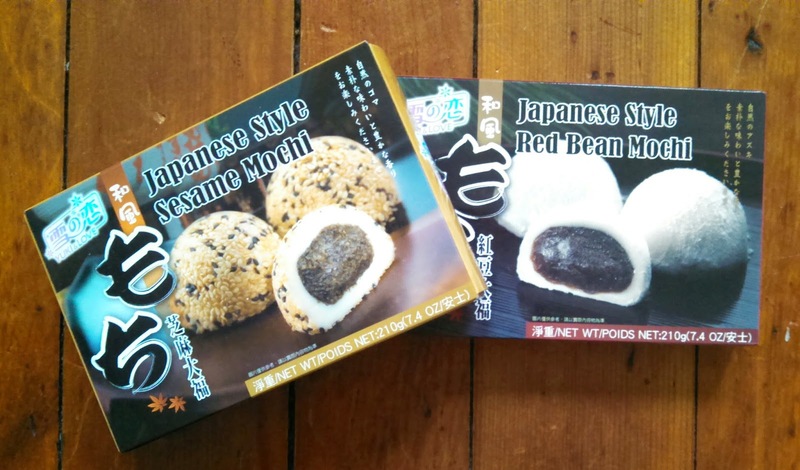 I could’ve sworn they had vegan mochi in the refrigerated section (at least they used to awhile ago), but I found these which had relatively good ingredients and weren’t too sugary. J and I shared a red bean one on the way home and really enjoyed it. 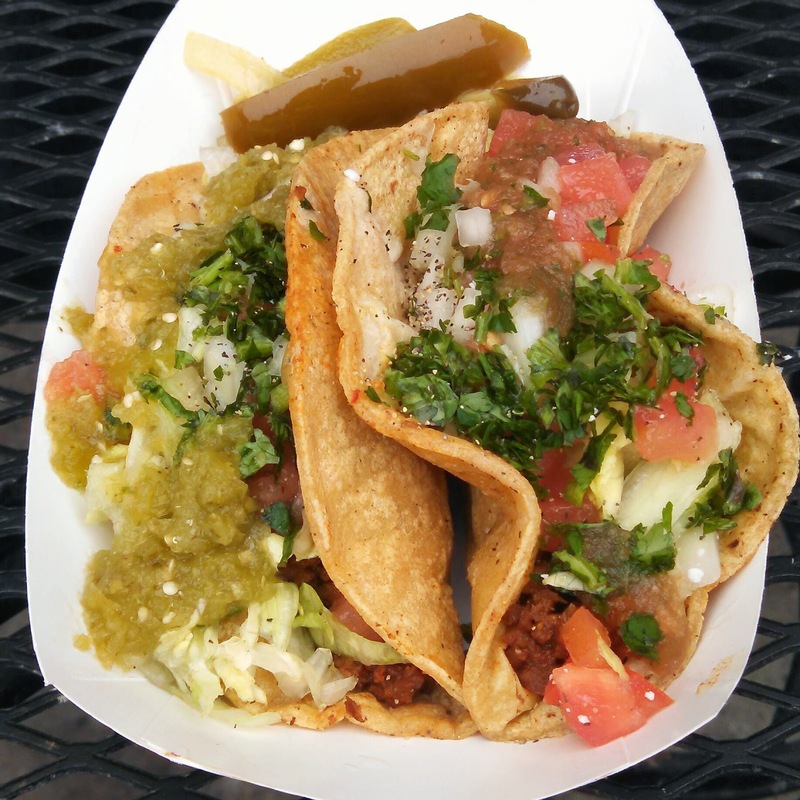 After Lotus, we went to Edgar’s to get soyrizo tacos. We both got two tacos, topped it with a few different salsas and put some pickled jalapeños and carrots on the side. Oh, how I have missed eating al fresco. While this winter wasn’t nearly as difficult to get through as the last one, I’ve realized (even more) how much I thrive in warmer temperatures. Sorry, Pittsburgh, but I don’t know if I can do this for much longer! And how were the tacos, you might wonder? Well, I had to talk myself out of ordering more by focusing on my hottie of a date. Yeah, they’re really good. I see many taco dates in my future.